The Chinese Super League (CSL) is in the throes of the most closely contested title race in its history with just three points separating the top four as they approach the home straight. Beijing Guoan and Shanghai SIPG share the top spot on equal points with the two sides meeting at the end of September in what is shaping up to be a championship six-pointer. With a third of the season left, Shandong Luneng are a point behind and Fabio Cannavaro's reigning champions Guangzhou Evergrande three points off the summit in what Chinese media are terming "a fierce battle" to the finish in November. 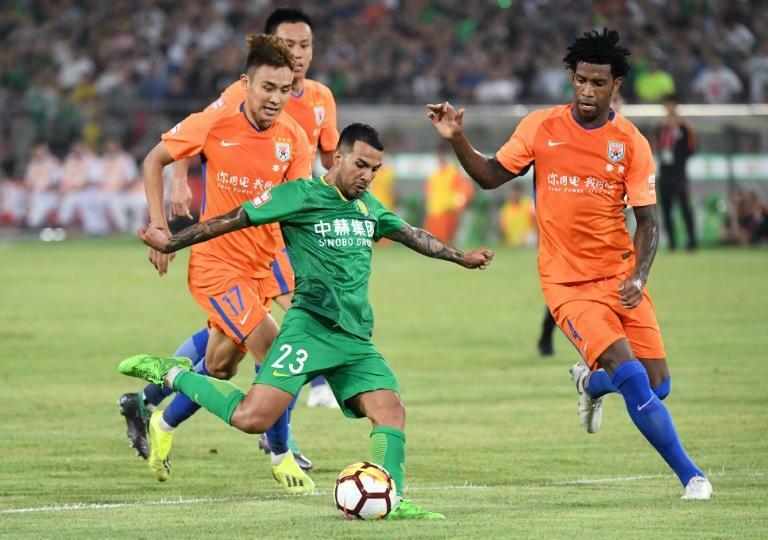 SIPG coach Vitor Pereira will feel that his side, boasting the expensive Brazilian duo Hulk and Oscar, are in slightly the better position because they have played a game less than Guoan and Luneng. And in Wu Lei, Pereira has the CSL top-scorer, the Chinese international plundering 18 goals in 18 matches this season. Wu was at it again on Saturday, scoring twice in a 3-2 away win at a Chongqing Lifan team who have picked up since Jordi Cruyff took over as coach earlier this month. The CSL took a two-month break for the June-July World Cup, leaving teams with a punishing schedule to make up for lost time. "The team was a bit tired because we've played three matches in a row in one week," the 26-year-old Wu said after scoring a 90th-minute winner at Chongqing, who are fighting for their lives at the other end of the table. "It was a very important victory... at a time when we are battling for the championship and facing this kind of opponent (facing relegation), you have to get the three points." Guoan and Luneng suffered surprise defeats at the weekend, in what might later turn out to be a pivotal weekend in a title race which now attracts global interest because of the star names playing in China. The respected Soccer News newspaper called this the "most remarkable" season since the CSL was formed in 2004 and said there was nothing to choose between "The Big Four". Guoan's 3-0 defeat at city rivals Beijing Renhe -- the visitors played 73 minutes with 10 men after the sending off of Jiang Tao -- was only a second loss in 19 games this season for Roger Schmidt's men. Cannavaro's Evergrande, who have won the CSL seven times on the bounce, profited with a 5-0 home thumping of Tianjin Quanjian and have played a game less than Guoan and Luneng. The Italian World Cup winner was again indebted to his Brazilian contingent as new signings Paulinho and Talisca both scored twice. Ricardo Goulart grabbed the other. Evergrande travel to Luneng this Saturday and Cannavaro was fulsome in his praise of midfielder Paulinho, who rejoined from Barcelona after the World Cup having had the briefest of breaks. "Paulinho is a benchmark for professional footballers, an example that all players should follow," Cannavaro said of the 30-year-old, who has been dubbed "Iron Man" in China because he has played so many games this year -- first in Spain, then at the World Cup and now back in China on loan. "The protection he gives the team and his reintegration has been perfect."